A shy young man’s life changes when he is offered the opportunity to learn how to control his dreams to improve his waking life in Adam Morse’ Lucid. Dreams are a common playground in fiction and for good reason. They offer a fertile playground that gives creative minds a world of infinite possibilities that don’t need to make sense or conform to any traditional storytelling rules. 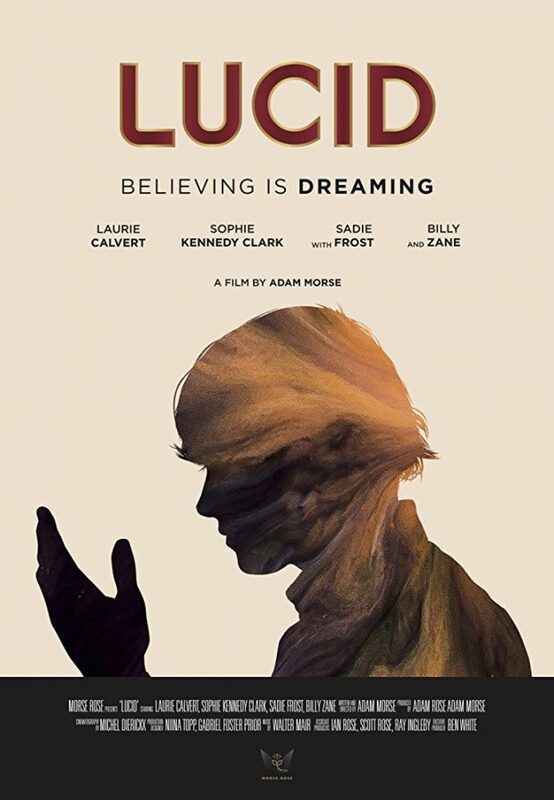 Films like Inception and TV shows such as Legion play with the idea of what dreams can teach people about themselves in their own ways and now Lucid enters the long list of media that plays around with the concept. Zel (Laurie Calvert) is a shy and retiring twenty-something with very little in the way of prospects or social skills. He lives alone and regards every interaction nervously which means that he has no friends and is stuck in a dead end job where he is unappreciated because he fails to stand out or stand up for himself. Zel is infatuated with Jasmine (Felicity Gilbert); a beautiful woman who lives in his building that he has never found the courage to interact with. Things change for him when he is approached by a mysterious stranger named Elliot (Billy Zane) who offers to help him improve his social skills through learning how to control his dreams and use them to practice conversations that he is too afraid to have in the real world. This is all to boost his confidence and allow him to interact with Jasmine rather than worship her from afar. All of this sounds like a solid basis for an interesting story and it definitely is to a point. Zel is an engaging character who is easy to relate to as many people can understand the crippling anxiety that comes with approaching a person or situation where the outcome could be embarrassing or negative so he is a likeable and relatable protagonist who has a lot of potential for development. Laurie Calvert is good in the role; never failing to be likeable or sympathetic and playing the arc from shut off to relatively confident in a believable way. The execution of the ideas this film has is where the problems lie though some of that may come with expectation. For example I expected a narrative where Zel starts to lose the concept of reality because he is unable to tell the difference between what is real and what is a dream but that doesn’t really happen other than some confusion in the middle point of the film that is easily resolved. This lack of any real drawback means there is no threat associated with what Zel is doing so the story lacks any sense of urgency. There are a couple of moments that are confirmed to take place outside of Zel’s dreams that would have made more sense as a dream sequence considering the leap of logic that is involved to make them believable. Most of the dreams take place inside a nightclub which is visually interesting to a point but starts to get somewhat repetitive after a while. I suspect much of this is a budget based problem but the repetitive location is a problem when the playground is whatever can be imagined. If the club had changed significantly as Zel grows more confident and tries imagining different things that he can play around with then it would have been an excellent visual representation of his arc while still highlighting his limitations through always using the same nightclub. I can see what the film was trying to do by having the club represent his comfort zone and the inability to leave it completely but the film never rises to that potential. Similarly there are some obvious repetitive hints that keep cropping up such as the continued mention of Zel’s focus on wooing Jasmine being incorrect and the clear suggestion of where he should divert his attention. The film makes the point well initially but returning to it constantly comes across as unnecessary. There were different ways this could be shown such as Zel building up a picture of Jasmine in his dreams and assigning a personality to his fantasy version of her before having that interaction and realising that she was nothing like that. Having the literal “dream girl” turn out to be contrary to how he wanted to see her could have been a really excellent moment of self realisation but instead their waking world conversation is fairly benign and doesn’t build to anything interesting. Billy Zane is great in the role of Elliot. He’s enigmatic yet accessible and conducts himself in a really gentle way that makes him easy to trust. Usually a character like that promising to fix the problems of a protagonist would end up having a sinister edge to him but that never comes across so it feels like he outlives his usefulness once he imparts the skills that help Zel gain this new ability. The film does well with the mentor/mentee relationship though more time spent actually teaching Zel the skills rather than delivering vague advice on how to control a dream would have been a much stronger way to build that relationship. What exists in the film is engaging enough in its own way and it’s fun to watch Billy Zane in this quirky yet compassionate mentor role but there was so much more that could have been done with it. Kat (Sophie Kennedy Clark) is another engaging character who would have benefited from more screen time. She had an important role in terms of her relationship with Zel and some of the other characters so having more opportunity to explore the sort of person she is. In the context of the film she is another “dream girl” though unfortunately the film doesn’t do very much with that either. Sophie Kennedy Clark and Laurie Calvert have great on screen chemistry and it was a nice touch to have her be the only person who notices him while showing him respect where so many others don’t. Christian Solimeno’s Theo is the standard abrasive antagonistic character who represents everything Zel is afraid to stand up to. To defeat him is to gain some self belief and that is something the film delivers in a really satisfying way. A lot of the waking world screen time is dedicated to Theo’s huge personality and overwhelmingly abusive attitude to everyone around him. He’s a natural obstacle between Zel and his own self confidence which makes for an engaging conflict. Despite the problems I had with this film I did find it really entertaining. I was constantly engaged in Zel as a character and his arc leading towards him becoming more confident in the way he lives his life. Some notable missteps prevent this film from reaching its clear potential but there are some really strong ideas and a talented cast certainly elevate the material. An entertaining if misguided film that benefits from strong ideas, engaging characters and a talented cast that manage to elevate the material. The main problem is that the film never makes use of the potential it has in its setup with the dreams being largely confined to a single repetitive location feels limiting and there is rarely the sense that there is any risk associated with Zel learning those skills meaning that the narrative lacks urgency because very little actually happens despite the obvious potential throughout. It is very entertaining and the cast are great but there was so much the film could have done that it fails to do.